Providing your kids with a birthday party magic show can be a great way to keep them entertained. They can sit quietly and watch the show or can participate and clap along to the various tricks. Everyone loves magic tricks and younger kids especially are impressed with even the simplest sleight of hand. Since a birthday party magic show is so much fun for everyone you might be tempted to put on your own show. It’s easy to think that you can buy a kit from a party supply store and just do your own card trick or other simple performance, but you might want to rethink that! Consider a few reasons why it’ good to have a professional on hand when you want to put on any type of show for your kids. 1. Magic is more complicated than you might realize. Even the simplest sleight of hand trick takes months to perfect, and performers will typically practice for hours every day to get them right. While a magic kit can provide you the tools and instructions needed to learn the trick, they can’t actually perform them for you and they often require some skill and coordination. Unless you want to spend weeks before the party rehearsing and perfecting your show, you may be better off hiring a pro. 2. You have other things to do at a children’s party. Trying to put on a birthday party magic show can be very involved. You need your props, your tricks themselves, and your own attention on the tricks to make them work. This takes your attention away from the party and your guests or your own children. You might ask other adults to help out during the party but this can put a burden on them especially if there are a lot of children in attendance or a lot of things to do, such as getting a buffet ready or cleaning up after lunch. Rather than distract yourself, it’s good to have a professional manage the show. 3. The kids may appreciate a professional performer. Kids may not be enthralled with mom or dad putting on a show but a professional performer may hold their attention more readily. 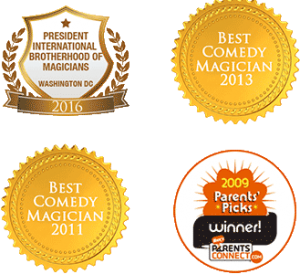 This will keep them entertained and occupied and make the party that much more special when you have a real birthday party magic show put on by a professional.